As my friends know, it doesn’t take much to make me think of Mark Twain. And even people I’ve never met who have followed my writings on China know about my obsession with Twain, since I’ve managed to bring him into discussions of a wide range of China-related topics, from Shanghai history (he never went there but has a San Francisco-bound fictional character set sail from that treaty port) to the Boxers (with whose cause he expressed sympathy in 1900). So, it’s no surprise that, when rumors about Jiang Zemin’s death flew and then were squashed recently, I found myself thinking of Twain. Mostly because I thought that Jiang could now make use of the famous line attributed to Twain: reports of my death have been greatly exaggerated. But also because, in one of his novels, Twain had two characters listening to people deliver eulogies about them — and if Jiang had had access to Hong Kong television, he could have had a similar experience. I’m not as obsessed with Shakespeare as I am with Twain, but the Bard is another favorite author who came to mind after the Chinese government, which had taken its time providing any information about Jiang, finally issued a statement dismissing as baseless rumors the by-then widely circulating and much discussed online reports of the former leader’s demise. More specifically, I thought of Much Ado About Nothing, the title of a Shakespeare comedy. This phrase came to mind particularly easily, I suppose, because I was traveling by train through a part of England not far from Stratford when the is-he-or-isn’t-he-dead rumor mill was churning fastest. The phrase also has a special link to Jiang, since he infamously referred to the 1989 protests and massacre as “much ado about nothing” during a television interview with Barbara Walters. In fact, though, while it would be foolish to make too much of the significance of a rumor that proved false, the flurry of speculation about Jiang’s fate and the Chinese government’s response to this speculation is not completely without interest. This incident — or rather non-incident — is one from which some meaning can be wrung. One thing that the non-incident shows or really just underlines is simply the capacity of the internet, and especially microblogging platforms such as Sina Weibo and Twitter, to magnify the significance of rumors about any place and increase the speed with which they spread. Rumors flew fast and furiously within China and around the world, first claiming that Jiang was very ill and then that he was dead, from the moment that Jiang, the man who succeeded Deng Xiaoping and preceded Hu Jintao as China’s paramount leader, failed to attend the main July 1 ceremony held to mark the 90th birthday of the Chinese Communist Party. Another thing, more specific to China, that the non-incident reveals is that the Party continues to be fixated with controlling the flow of information and putting a carefully thought out spin on events. And that this can make it much slower to respond to news than other organizations, which in turn helps create a vacuum in which rumors can gather momentum. The Chinese authorities are good at moving swiftly to try to stop people from expressing certain kinds of opinions or even using certain kinds of words — as shown by internet censors blocking the use of any character in Jiang’s name and the most common term for “heart attack” in posts. What they are not good at doing is offering up even very simple statements of fact, until they have weighed the pros and cons of presenting it in different ways. These recent developments also reminded us of how skeptical international news organizations, and at least equally importantly Hong Kong media, are when it comes to assuming that if something important has happened in China, Beijing will let them know. No one thought, in other words, that if Jiang had died, the Chinese government would be as quick to announce this fact as, say, the American government would be when a former president passes away. There is justification for this skepticism, if we think not just about past deaths of Chinese leaders but also about how slowly news about SARS was allowed to circulate and, more recently, the effort to prevent word of the tainted milk scandal from spreading until the Olympics were over. All of this is noteworthy, but neither the unusual nature of the current moment in history nor the peculiar handling of the media by the Party should be overstated. There were widely believed rumors about China that gained traction long before the internet was around and long before the Communist Party was founded — let alone came to power. And here, we can go back to the days of Twain. During the Boxer crisis of 1900, the international press reported in July that all of the foreigners held hostage in Beijing had been killed. In fact, they had not. When foreign troops stormed into the city in August, nearly all the foreigners who had been captive were freed alive — and some of those who were freed later commented on their ability to read their own obituaries in old copies of newspapers. 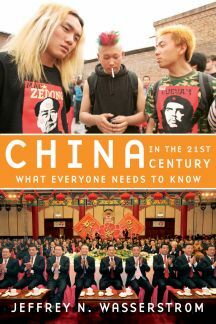 Jeffrey Wasserstrom is Chair of the History Department at the University of California, Irvine, and the author, most recently, of China in the 21st Century: What Everyone Needs to Know. His reviews and commentaries have appeared in newspapers such as the Los Angeles Times and a wide range of magazines and journals of opinion, including New Left Review, the TLS, the Nation, the Huffington Post, Time and Newsweek. He is the Editor of the Journal of Asian Studies and co-founder of the UCI-based China Beat blog/electronic magazine.